As the country moves back to the business of picking up the pieces of the economy, it is important to reflect on the new voice that has come into the White House. While Rush Limbaugh is uttering toxic rhetoric, we can choose to focus on the direction that is being exemplified by Barack Obama. The week that celebrated Martin Luther King Day and the inaugural events, spoke to the potential of a restored image for our nation. On January 19th, I attended an interfaith service in New York City with my son, sponsored by The Park Avenue Christian Church and The Temple of Universal Judaism. It was their 12th Annual Rabbi Abraham Joshua Heschel – Dr. Martin Luther King, Jr. celebration. The Polish-born Heschel marched with King in Selma, Alabama. Their birthdays were days apart. The evening’s honoree was Dr. Akbar Ahmed, a leading authority on contemporary Islam. He served as the High Commissioner of Pakistan to the United Kingdom, and is currently the Ibn Khaldun Chair of Islamic Studies at the American University in Washington, DC. His work as a diplomat, filmmaker, author, and anthropologist is widely recognized. Ahmed has been traveling across the United States during the past twelve months, to conduct a study of American society through a Muslin prism. The service began with children lighting peace candles, and was led by Rev. Dr. Alvin Jackson, Rabbi Gary Bretton-Granatoor, Iman Shamsa Ali and Rev. Dr. Donna Schaper. Passages from the Old and New Testaments and the Holy Qur’an were read. The music was culled from Christian Hymns, Hebrew songs, and Black spirituals. Psalm 121 was sung in Arabic. Dr. Ahmed’s son, Umar Ahmed, accepted the award on behalf of his father. He spoke of dialogue and friendship as the key to ameliorating conflict and turmoil, and quoted the prophet of Islam [Muhammad] who preached, “The ink of the scholar is more sacred than the blood of the martyr.” Dr. Ahmed, through his wide-ranging work, has been fostering intercultural understanding. And the people that I meet. The service ended with several verses of “We Shall Overcome,” as the whole congregation joined hands. The closing stanza was, “We shall live in peace someday.” It was hard not to think about how far the country has come from the time of the 1960’s, when the news was filled with footage of sit-ins, fire hoses unleashed against black citizens, Bull Connor and his attack dogs, and church burnings. It will be easy to fall back into the rancor and divisiveness of the previous decade, without a concerted effort to stay connected to our better selves and a larger image of a united America. Striving for that ideal is not a new concept. 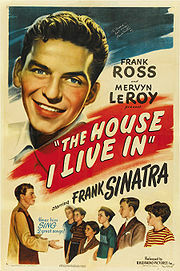 In 1945, The House I Live In, a short film, was released. Frank Sinatra was featured, speaking and singing to group of urban kids about tolerance. The lyrics were written (under a pen name) by Abel Meeropol (who also wrote the anti-lynching song “Strange Fruit,” made famous by Billie Holliday). A Jewish schoolteacher and activist, Meeropol adopted the children of Julius and Ethel Rosenberg. A home for all God’s children. The song was recorded in 1947 by Paul Robeson. Patti Labelle sang her version to Frank Sinatra on his 80th birthday. Moving forward in our evolution as citizens with a wide range of differences, “The House I Live In” makes good background music as we roll up our sleeves to get the job done.